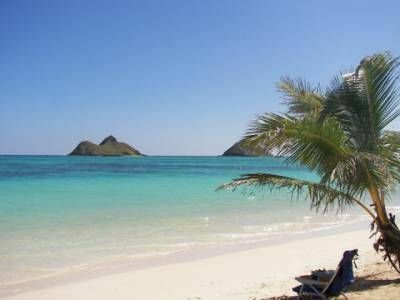 Relax in the comfort of a beautiful vacation home on Kailua Beach, Oahu, Hawaii. Swim in warm, turquoise water, walk on soft, white sands, enjoy tropical gardens away from the big city. Our bright and specious new vacation rental home is located on the NE cost of the island of Oahu, just 17 minutes from Honolulu airport and away from busy Waikiki hotels. We can accommodate 12 guests with privacy and comfort for all. The gated entrance opens to a private tropical garden with native Hawaiian plants, where you can prepare local, fresh fish or beef on gas BBQ and enjoy warm evenings under the palm trees. Your accommodations are tastefully furnished and decorated with original artwork. All bedrooms have full , ensuite bathrooms, 10 feet high ceilings, air conditioning, cable TV. Free wireless internet, parking, beach towels and beach gear and free laundry facilities. The layout of the house provides privacy for all - yet you will be together. Kailua Beach is safe for children and adults. The reef protects Kailua Bay from big waves. The ocean here has a sandy bottom with great areas for snorkeling, kayaking, surfing, boogie boarding, wind kiting and diving. We have 5 bedrooms, 5 bathrooms, a kitchen and a living room. Jungle and Gardenia studios are located on the main floor. Hibiscus, Ocean , Plumeria rooms , the kitchen and the living room are on the second floor. We can add one more room for larger families. I was born in Poland but lived in England, Libya, Canada and the Eastern USA before I discovered Hawaii. From all the islands, I chose Oahu because it has so many amazing places, beautiful beaches, incredible mountains, rich cultural life, unique historical spots, excellent international cuisine and relaxed island shopping. I live here from 2000 and every week discover yet another new place. People, nature, the weather, the ocean here are just perfect , really like in a paradise. I enjoy meeting new people and working from home. I am an artist and whenever possible I paint and sculpture. Having vacation rental property allows me to combine both. I chose this property because it is modern, large with 3 gardens and with ideal location- just one minute walk from the house to the beach. Our house is located on #1 voted the most beautiful beach in the USA. Far away reef protects us from big waves, white powder-like sands invite for long walks, there is plenty of shade on the beach- one can read for hours without direct exposure to the sun and play in shallow or deep water. Our guests may enjoy all water sports here. It takes only 17 minutes from Honolulu airport to the house from 10 to 20 minutes to all Oahu attractions. Each bedroom has a full bathroom. Each bedroom has AC. 7 adults and 3 children totally enjoyed our stay in this well stocked, spacious house only steps from the beautiful beach. Thank you Anna for a memorable vacation. Our family of twelve enjoyed a grand reunion on Kailua Beach. We found the house’s five bedrooms , each with its own bath, & sitting area very adequate. The outside eating area, complete with barbecue was perfect and we ate most of our meals there. The owner was very welcoming, easy to work with and so accommodating. The location is perfect as it is steps away from the beach, quick shopping and good restaurants. Our only negative thought was the kitchen is outdated and difficult to prepare meals for 12 people. We would recommend this rental. Loved the place. Hated the Homeaway service fee. Location, Location, Location. Great place with unbelievable location. But, when looking at our credit card we realized that we paid almost a 10% service fee to Homeaway we were apalled and will never use their site again. Plus, they did not even process a payment. We had to write a check to the owner who was very sweet and trusting. After two years of planning a long overdue family vacation, we decided that renting a house rather than staying at a hotel, was the best choice. After several searches online we came upon the Coral House. With 7 adults and 4 kids (tweens & teens), the size and location seemed perfect and we immediately contacted Anna to make a reservation. She was very friendly and quick to respond. She kept in touch with us until our arrival. When we arrived in Kailua, at the Coral House, it didn't disappoint! Everyone was able to pick a room that was perfect for them, the kitchen became the gathering place for meals and making plans for our daily adventures. We were also able to use the grill and have a nice dinner at the table and chairs outside. Anna, who is the owner, lives at the other end of the house, but was never intrusive. She was even kind enough to wash the beach towels that had been used as well! So many places were within walking distance, including the beach, the Kalapawaii Market, Island Snow, Bob’s Pizza, Buzz’s Steakhouse, and many others. Perfect for those days when you didn't feel like driving anywhere. We absolutely loved our stay at the Coral House and recommend it to anyone who wants to vacation with a large group. We hope to come back again ourselves! Shawna, it was a pleasure to host your family. What a well organized and nice group! To see my guests happy and enjoying every day of their vacations- make my effort of running this business worth while. I did not realize how long it takes for a family to organize the reunion. Your comment will help me to contact again guests , who are just in the planning process. We stayed here three nights with a large family group - 2 families of four, plus three grandparents. We used all five bedrooms, and had plenty of space. The AC in each room was so amazing during the August heat - kept us cool and the rooms were quiet - everyone slept well. All beds were very comfortable, rooms were clean. We used the kitchen for breakfast each day. It was so hot in the evening that we really didn't want to cook in the kitchen, but were happy to sit at the large table and eat food we had picked up. The location is great. It's a very quick walk to the beach. Do not even try to park at the beach, even if you find a spot, you will walk farther than from the house! The store right next to the house has great food - we ate dinner and lunch there. They have salads, burgers, wraps, pizza, etc. They also serve coffee and breakfast. Anna provides beach chairs, mats, boogie boards, and snorkel gear. There was a styrofoam cooler in the kitchen, which we took to the beach. The coded gate made us feel very secure. It was an easy drive to Pearl Harbor from the house, so don't think you are "too far" by staying in Kailua. Several grocery stores nearby allow you to pick up anything you need! Our family group consisting of my 4 children, their spouses and children as well as me (Grandmother) spent delightful week in this house, just a half block walk to one of the most beautiful beaches I've ever been to. We rented the entire house, and it worked out so well for our group, as each family or couple had their own space (with full bath, television, and some even had little kitchen units). We also had a living room and generous kitchen to gather in, as well as the yard, which is surrounded by a wall for privacy, and it also keeps small children contained. The house has comfortable beds,is very well stocked with linens, including beach towels, and had an ample supply of beach gear. Across the lane (which leads to the beach, three houses down) is a grand little market/deli, where you can get last minute items, and great Hawaiian coffee). The beach is beautiful....deep, tree lined for shade with fine white sand which is so easy to walk or jog on (over four miles of it) and at the end of the public beach nearest the house is an area where wind surfers, kite surfers, etc. practice.....fun to watch. Kayaks can be rented near-by as well. There is a very good restaurant in walking distance along the beach, and the town of Kailua is large enough to have stores and eateries for all necessities and tastes....even a big Target! Kailua is a short drive from Honolulu, and if you take the coastal route there, you'll pass many areas of interest. Since it is on the windward side of the island, Kailua always has a breeze, and we never even used the air conditioning units in our rooms (the ceiling fans were enough). I could go on and on (can you tell?) about our stay there; we come to Hawaii often, and this is among the favorite places we've stayed. Of great importance to me was the friendliness and helpfulness of Ania, our hostess (not to mention her good humored tolerating of some of the mischief the children got up to.) Ania and her husband live in the other half of this huge house, and are always there to solve any problem or answer questions, recommend points of interest, etc. They went out of their way to accommodate us, yet were never intrusive. Ania gathered and washed the bath towels regularly, so there was never a shortage, and this was a herculean feat, considering the size of our group! I hope we can repeat this special trip in a couple of years and hope Ania will have us back. This is truly a special place, and I highly recommend it!